Way back at Computex, iBuyPower caught our attention with Project Snowblind, a system that trades RGB lighting for a transparent LCD side panel. 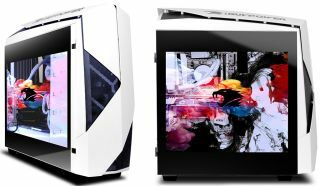 It was only a concept back then and iBuyPower didn't have pricing information to share, but that's no longer the case—iBuyPower is now taking pre-orders for its Snowblind PC starting at $1,499. We'll get to the system configurations in a moment, but first let's talk a bit about the side panel. It's a transparent and fully customizable LCD panel with a 1280x1024 resolution. The display connects through DVI on the back of the case to your graphics card and functions as a second monitor. Though it can be used to play games on, iBuyPower recommends against doing so and notes that it was designed specifically for showing off your PC's guts. If you want to see more, there are a few other videos of the Snowblind PC on iBuyPower's YouTube channel. Getting back to the available configurations, there are three baseline models: Snowblind ($1,499), Snowblind Pro ($1,799), and Snowblind Extreme ($2,499). The least expensive model sports an Intel Core i5-7400 CPU nestled into an MSI Z270 Tomahawk Arctic motherboard, 8GB of DDR4-3000 RAM, a GeForce GTX 1070 graphics card, and 1TB of storage. iBuyPower's Snowblind Pro upgrades the CPU to a Core i7-7700K, doubles the amount of RAM to 16GB, and adds a 240GB SSD to the mix. At the top end, the Snowblind Extreme also comes configured with a Core i7-7700K CPU, but trades the motherboard for MSI's Z270 XPower Gaming Titanium, bumps the RAM up to 32GB, swaps out the graphics card for a GeForce GTX 1080, and pairs a 480GB SSD with a 2TB HDD for storage duties. All three systems can be customized by going here. Orders are expected to ship at the end of February.